Lord, give us guidance and wisdom in planning our paths for the future! Amen. 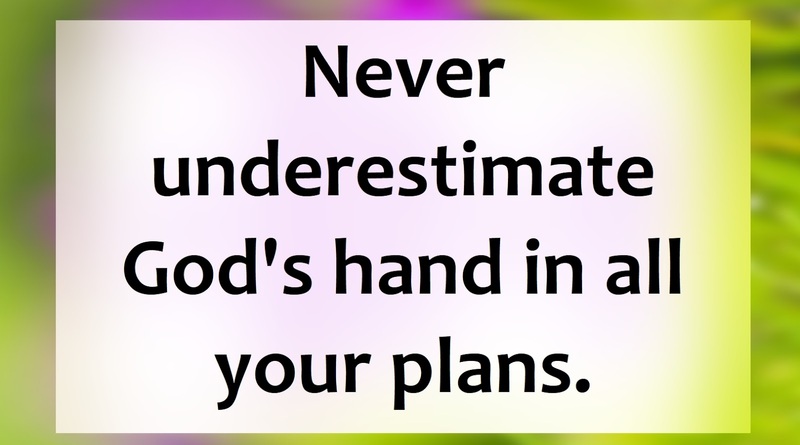 We can make our plans and establish in our minds the way we are going to go, but when we go, God is in control of and directs each step that we take. What a comforting thought that is -- to think and to know that every step we take and every breath we take, God is right there beside us directing our path! If, en route to a destination we planned in our minds, we stumble or fall, He is always there to pick us up and put us back on our path. If we establish a path for ourselves that would lead us out of God's will, His direction and guidance will help move us toward the right path that leads to Him. All we have to do to have this guide come with us and lead us in our journey, is to let Him have control. As my pastor said, we must allow Him to be that author and guide in our lives, and He will be more than happy to accept the position. Prayer: Our Loving Heavenly Father, we ask today for you to be our guide and the author of our lives. We hand over to You the pen to write out each new page of our life story, and we ask that you give us guidance and wisdom in planning our paths for the future. Thank you for hearing and answering my prayer. Gratefully, In Jesus Loving Name I Pray, Amen.